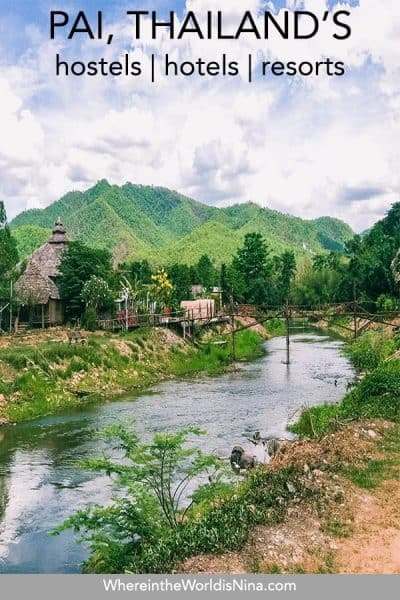 Pai is one of the most popular destinations in Northern Thailand, a hippy town that has been drawing travelers for years. Nestled deep in the mountains down a road that has over 700 curves, expect a cool, laid-back atmosphere where your hardest decision will be deciding where to stay in Pai. 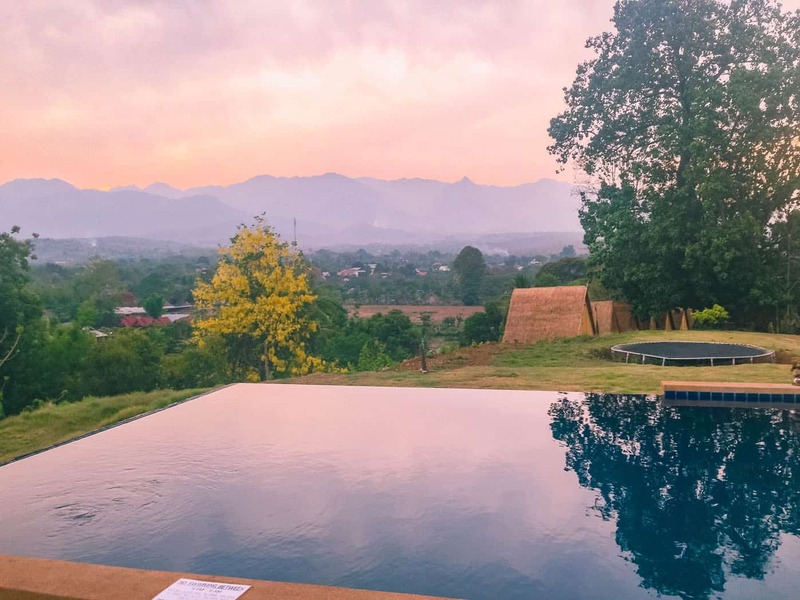 Whatever your budget, there will be somewhere ideal for you to stay in Pai, so let’s take a look at some of the best options. 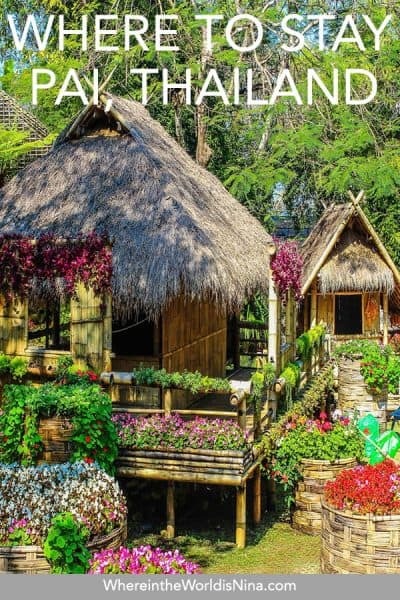 Accommodation in Thailand is relatively cheap when compared to other countries around the world, therefore you can get some serious bargains when it comes to Pai hostels. Although these hostels may be cheap, they all have great reviews and are close to the city center, so are a good option if you are a little budget conscious! Clean and simple dorm rooms to reasonably priced standard rooms, this Pai hostel is an easy choice. Located in town just moments away from the bustle, people really seem to like this humble spot. Views of the rolling hills, surrounded by lush greenery, and hammocks to get lost in, this resort and hostel in Pai is one to consider. Depending which rooms you book you also get a breakfast included all for a fair price. Located just outside the center of Pai, Ming Guesthouse is a steal of a spot. It’s close enough to walk to everything without being on the main drag. There’s a serene garden view for most rooms, coffee in the morning, hammocks to relax in, and even a kitchen should you want to whip up a few meals yourself. Spicy Pai Backpackers is located just 1.2km from the main Pai bus station, so you won’t have far to walk after your travels. Surrounded by mountains and rice fields, you will get a sense of the real Thai countryside, while still within walking distance to the town center. Each bed in the dormitory style accommodation comes with linen and a mosquito net, plus you can tuck into free tea and toast in the common area, all which contribute to making it one of the best Pai hostels. You may find some varying reviews of this place and your accommodation here won’t be anything super spectacular but it deserves a place on this list for a reason. The setting of this Pai hostel makes up for everything. Set in the rolling hills with views of the town and an infinity pool to boot, you’ll find yourself falling in love and not spending much time in the room at all. Chilling with a great view at this Pai hostel! Add to that the circus factor with classes on hooping and juggling, parties, and some great social vibes and you have yourself a winning hostel in Pai to stay at! Tucked away on the outskirts of the Thai jungle, Pai River Villa is made up of a collection of 18 villas, perfect if you are looking for a little rest and relaxation without venturing too far away from the hostel prices. All rooms offer balconies or patios, so if you are a nature lover then this Pai accommodation could be a good shout. You can also give the in-house restaurant a try for a unique dining experience, ideal for those that don’t want to wander too far for a bite to eat. These next few options when it comes to Pai accommodation are a step up from Pai hostels. These hotels are perfect for those who want a little luxury, but don’t want to break the bank in the process! The aim of Baan Pai Nai Wieng is to make you feel like you are in a home away from home, and it has been pretty successful. All guestroom are full of a variety of comforts such as air conditioning, 24-hour room service, wi-fi, and a balcony or terrace. Its strategic position ensures that you are only a short walk away from some of the area’s main points of interest, and after a long day of exploring, you can relax in the calming atmosphere of the hotel’s gardens. Just a stone’s throw away from Pai bus station, Pai Smilehouse offers a unique place to stay in the heart of the city. Each standalone room has been tastefully decorated in dark woods with Thai vibes, fitting with the mountainous surroundings. If you don’t mind splashing out a little more, you can even get your very own raised terrace and spend your evenings in a hammock watching the sunset. Why not live the life of luxury for a few days at the conveniently located Pai Cherkaew? Colour, vibrancy and fun sum up what will greet you when you arrive at Kirina Retro House, where you shouldn’t be surprised if you find a quirky wall feature in your bedroom or bathroom. Despite the name, this Pai accommodation is modern and comes with all the necessary amenities for a comfortable stay. With complimentary tea and coffee, wi-fi and slippers, what more could you want from a city center hotel? You don’t have to spend a huge amount for Pai accommodation to live the luxury lifestyle. Expect some stunning views, premium service and all the home comforts you could wish for. If you don’t mind spending a little more money, the hotels below are all great options of where to stay in Pai. Pai River is a great place to just chill. This hotel is made up of private huts set into the Thai foliage, surrounded by wildlife and greenery. 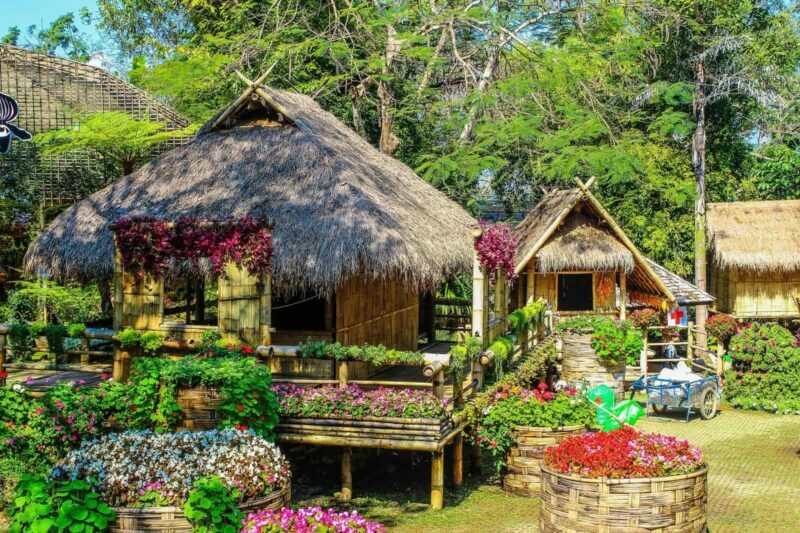 Pai Village Boutique Resort and Farm has a focus on maintaining the green environment, and with the farm located just 5 minutes from the resort, you can experience a myriad of fruits, flowers and animals during your visit. Each room is set in true northern style, while also providing all the necessary amenities for a truly natural and unique Pai accommodation. This modern hotel simply oozes cool. Located in the city center, you will be in easy walking distance from the legendary Night Market, the iconic Pai River and many other main attractions. With only 4 rooms, you can rest assured you will be well looked after. 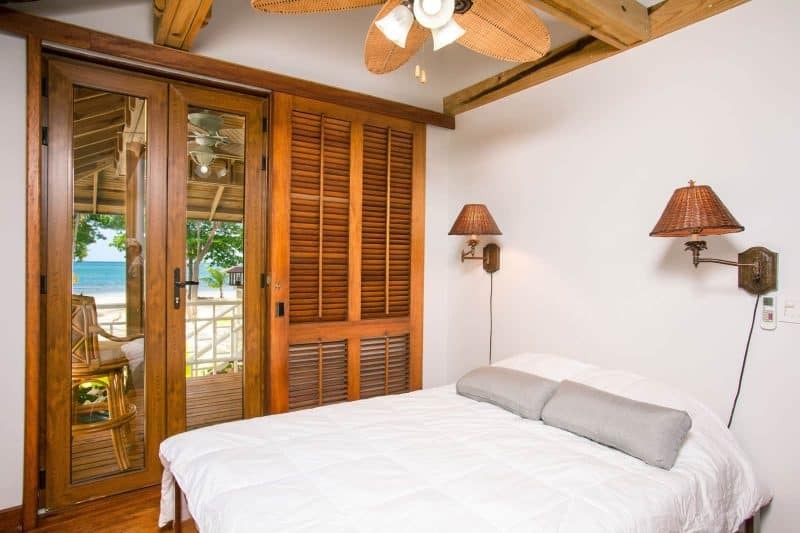 Each boutique room has a broad range of amenities including a smart TV, rain shower and mini-bar, while the quaint garden exudes an atmosphere of peace. While slightly more out of town than some of the other hotels, a stay at Pai Vimaan Resort will be well worth the longer walk. Set on a huge plot of land on a hill overlooking the city and surrounding countryside, many rooms have stunning views of the river and mountains. Each room is styled with a mix of modern furnishings with traditional Lanna elements for a truly soothing stay. If turquoise pool waters, palm trees and shaded sun loungers are what you are after, then The Quarter Resort is for you. Located in the mountains surrounding Pai, it has a distinctly rustic charm, with 36 guestrooms scattered between quaint courtyards. All rooms have a private seating area and private balcony, and is not a place you will forget in a hurry! TIP: 12go.asia is the best way to book ferries, buses, and trains ahead of time in Thailand! 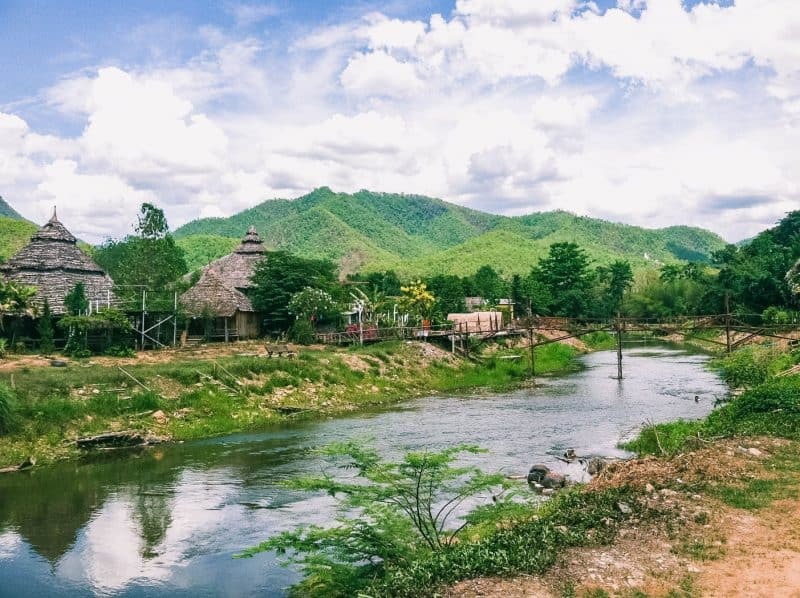 Read more about the things to do in Pai, Thailand here! Which of these places to stay in Pai are you looking at?